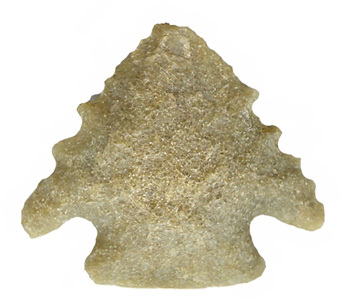 General Description: The Palmer point type is a small sized point having corner notches. The blade is triangular in shape having straight to slightly concave or convex edges that are mostly serrated (some examples are deeply serrated). The stem is short and expanded and has a straight basal edge. The stem edges are ground and thinned. The shoulders are strongly barbed. The cross-section is biconvex . The points are made by pressure flaking. 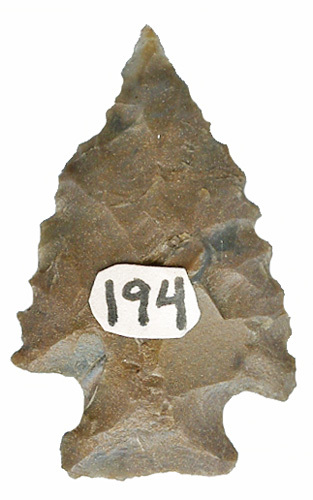 The serrations appear to have been made at the time when the point was finished, since the flake scars produced by the serrations are long an overlap toward the center of the blade. The notches are formed by the removal of deep broad flakes. Local materials were used the manufacture of the Palmer type. The Palmer is found in the Carolinas, and are also found in Georgia, Tennessee, Alabama, Virginia, West Virginia, Kentucky, Mississippi, Louisiana, Arkansas, northeast Texas and southeastern Oklahoma. Coe indicated that the type could also be found northward along the Atlantic Coast into New England. The maximum length of the Palmer is 60 mm; minimum 28 mm and average being 35 mm. Maximum width is 25 mm, minimum 15 mm and average being 20 mm. Maximum thickness is 12 mm, minimum 5 mm and average being 8 mm. Perino suggests a relationship to the Kirk Stemmed point exists. The Palmer type was named by Joffre Lanning Coe in 1964 for Palmer Mountain which was near the Hardaway Site in Piedmont North Carolina.